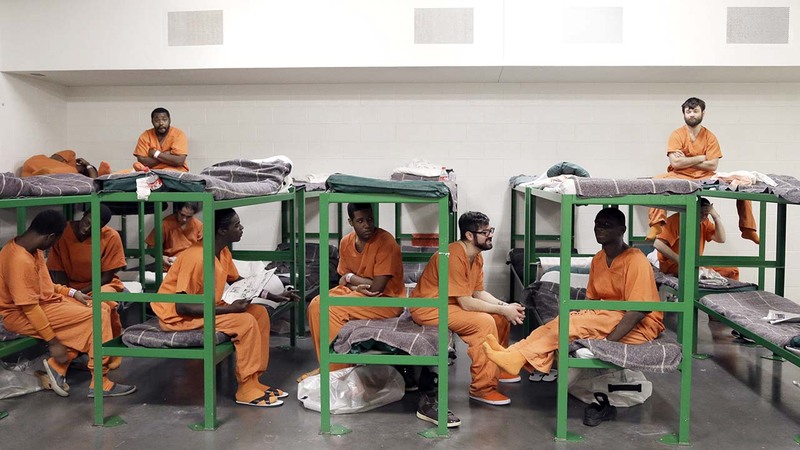 DALLAS, Texas -- Several Texas counties that are struggling with debt because their jails have few or no prisoners hope to refill those cellblocks with a different kind of inmate: immigrants who have entered the country illegally. In some cases, the strategy worked, at least for a while. But a decline in crime and an increase in alternative sentencing reduced the Texas prisoner population and created a glut of jail space. Now the debts, utility bills and maintenance are becoming so burdensome that counties are confronting a difficult choice. They can seek a federal contract to house some of the immigrants expected to be detained in President Donald Trump's immigration crackdown. Or they can sell the vacant detention centers to private prison companies that aim to do the same. "Anyone with vacant beds is hoping the federal government will lease them at a much higher rate," Lisa Menard, acting commissioner of the Vermont Department of Corrections told lawmakers in February. "Immigrations and customs enforcement are looking to lease beds everywhere." Management and Training Corp. recently purchased a South Texas detention center that was shuttered after a 2015 inmate riot left it uninhabitable. The Willacy County Correctional Center, about 45 miles north of the Mexico border, fetched close to $68 million, allowing the county to pay off the construction bonds. Until the riot over alleged deficiencies in medical care, the company ran the facility in a private-public partnership with the county. Company spokesman Issa Arnita said MTC was "working closely with ICE and hoping to get a contract." Officials in Maverick and Jones counties confirmed that their empty correctional centers were being purchased by the private prison company known as the GEO Group Inc., which runs the most immigrant detention facilities of any private company operating in Texas. A spokesman for GEO said the company does not comment on specific transactions. Like a handful of other counties across Texas, Maverick County formed a nonprofit corporation - the Maverick County Public Facility Corporation- to obtain financing through municipal bonds and insulate the county from direct financial responsibility. A private operator would then run the detention center and split the profits. After a 2013 contract disagreement with GEO over the division of profits, the private company pulled out and the county tried to operate the facility and repay the bonds, said Maverick County Judge David Saucedo, the county's top administrative officer. The county eventually reached an agreement with bondholders to foreclose on the facility. Other counties have entered into agreements with private prison companies to renovate their empty facilities in expectation of reopening if immigrant detention opens opportunities. However, some county officials say they have no plans to work with prison companies because of previous experiences. After Emerald Correctional Management pulled out of its contract to run a 600-bed facility in 2014, La Salle County decided to operate the detention center itself. With 350 to 450 prisoners on any given day, many picked up by the U.S. Marshals Service, the county about 40 miles (64 kilometers) north of Laredo is finally turning a profit. Judge Joel Rodriguez was cautious about the prospects of an increase in immigrant detentions. "There are a lot of facilities in Texas sitting empty," he said. "And I don't know if they will be filled because of this." Associated Press Writer Cory Dawson in Montpelier, Vermont, contributed to this report.